1. What title character endures an abusive boarding school run by Wackford Squeers in a novel published in 1839? 2. 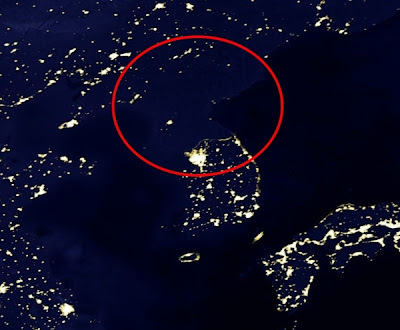 What country is circled on this nighttime satellite image? 3. This Royal Decree, passed in 1598, granted limited religious tolerance to French Protestants and allowed France to prosper from the skills and energies of a disproportionately well-educated and entreprenurial population. When it was revoked by the Edict of Fontainebleau 87 years later, a wave of talent poured into England, the Low Countries, and North America, priming these places for the Industrial Revolution. 4. What African country has almost double the population of its closest rival, Ethiopia? 5. You can tell this person has been well-behaved because she has a _____________. 6. The narrator calls the title character light of my life, fire of my loins. My sin, my soul. Her name is the tip of the tongue taking a trip of three steps down the palate to tap, at three, on the teeth. But what's the author's name? 7. It's the blue ice giant with Great Dark Spots. What is it? 8. 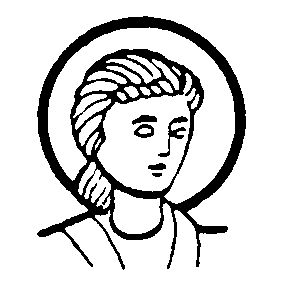 He was associated with water, the sea, and horses, and his holiday was celebrated on July 23. Who is he? 9. Ghastly as it might be to imagine it, you have some of these inside your body even as we speak. What are they?!? 10. What country has eight of the world's ten highest mountains? The tie-breaker: Recommend some good movies that begin with this week's letter. Put your answers in the comments, or Wackford Squeers will give you a whipping! Movies? Oh, dear. Nambi (about a real sissy deer); No (Country for Old Men)--yeah, a real upper; Nest in Show--about a bird that won at Westminster; Nolita--about a teenaged Dadaist; No Way Out--there are a couple of movies with this title, but good ones? ; No, No, Nanette--perhaps the N-iest one; Naughty Marietta--now, that one IS good. 8. Neptune (god) and July 23 is my birthday! 3) "Now let's play nice, folks!" 2. North Korea. Wow, look at all the lights on in Japan. 3. (Edict of ) Nantes. 6. Nnnnn ... not coming up with a name. 6. Oh, wait, of course - Nabokov. LLT. Should have remembered my linguistics class sooner. Uh, three tepid cheers for North by Northwest, Notting Hill and No Country for Old Men. 1. Oh man, does it start with "Girl number twenty! Your definition of a horse"? That seems about the right era. I remember being in a homeroom class while reading it, and that it was in the theatre, because it wasn't really my homeroom class. I had decided that I wanted to be in the same homeroom as my friend, so capriciously declared that my new last name was Aardvark, and they let me get away with it. Honour students can get away with anything. But what was the book? Nnnnn ... Northanger Abbey, Nancy Drew, Nathan, Nicholas, yes Nicholas Enderby .. no Nicholas ... damn .. Nicholas Nickelby? I think that's a real book. But I don't think I've read it. But I don't remember the name of the one I read, nor do I know if it was the right one. I'll stick with that. Quadruped, gramnivorous. Partial to hay. Do I actually remember anything, or do I just alternate between making things up and deriving from first principles? 2. 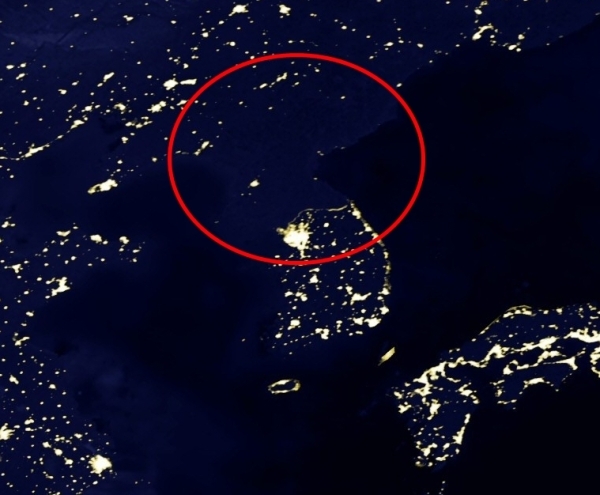 North Korea - All that nuclear power and they can't run a light bulb? 4. Nigeria - It's the only populous African N-country that comes to mind, but closest rival in what? Rivals in warfare are usually neighbours. Nigeria produces oil, maybe some kind of edible beans or grain, but I didn't think it competed in coffee production? What the heck would Ethiopia rival another country at? Maybe Shakespearean references. "Like a rich jewel in an Ethiop's ear versus, well Nigeria, maybe Numibya has to turn up somewhere. Who has a Shakespeare concordance? 5. There's an N-word for that? What might it be? numb look? nhalo? nimbus? I wish I knew more Latin. 6. Nabokov - I had no idea about this one until I actually paid attention, and acted out the quote. Then I was sure. That's awesome. 7. Neptune - not really that giant, though. It must really be a moon I don't know. Or that I do know but that isn't coming to mind. Nefertiti, Nera, Nora, Nightrider, Nightmare, no, I'll stick with Neptune. It's giant compared to my car. 8. Neptune - I know this from a Rupert the Bear book. 9. 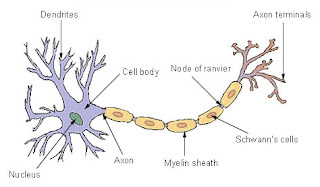 Neurons - I was going to answer nemotodes, until I scrolled down and saw the picture. And now I'm second guessing myself and wanting to say it's an ordinary nerve cell. But I'll stick with neurons. 10. Nepal - I heard that private aviation is illegal there, just because they can't afford the SAR costs. I don't know if it's true. The Net & North by Northwest - Apparently I like chase movies. I only just learned that that was a genre, but Terminator, Bourne Identity, Hunt for Red October, The Fugitive ... yeah, I like chase movies. 8. Neptune since it ain't Nero! Believe it or not...I've drawn a blank here. I even checked my Netflix recently watched list and came up nil! man am I the only one who didn't pick up on the N theme? dang... *this* is why I don't do the wednesday quiz anymore. Aviatrix, the book that starts with a classroom scene about horses is Hard Times, Dickens' attack on utilitarianism. Thanks, Eaven. I googled it afterwards. Mr. Gradgrind. I always liek to show my work on the quizzes. Rebel, I frequently do the whole quiz without noticing, then the bonus question tips me off and I have to go back and pick the answer I like best, then change all the others to match that letter. 10.Nepal (if you ignore underwater mountains). 9. 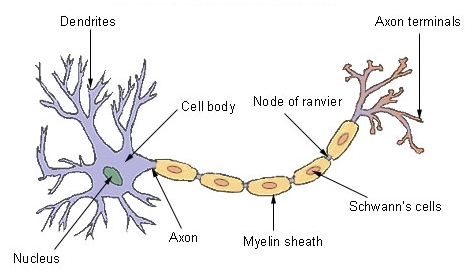 Neurons; half marks for nerves. Reb, don't feel bad; we're still in the phase where somebody gets the memo every week. You'll find that they are a lot easier once you know the secret, I'll bet. And the winner this week is THE UNITED STATES POSTAL SERVICE, which hand delivered a written response to the Wednesday Quiz from New York City shortly before noon on Friday. Thanks to everyone for continuing to humor my quizzing endeavors.